oil 10x8 inches Purchase info here. If you think pigs are cute, this little piglet is even cuter in person. The yellows are a bit calmer, more golden. Yellow is one of those colors that is hard to photograph. oil 6x6 inches. Purchase info here. Hang this on your kitchen wall and the colors will wake you up in the morning. You won't even need a cup of coffee! Well, maybe so, just because coffee is so yummy. oil 6x6 inches Purchase info here. This is a sweet little painting close up. It has that brushed texture underneath from an application of oil ground. A sweet thing happened the day I painted this back in February. As I mentioned a while ago, January was a rough month. I was trying to paint myself out of a funk, and this day I felt especially defeated. Out of the blue came a phone call from someone who had purchased one of my little paintings years ago. We had never had any contact, but she called that day just to tell me how much she has always loved and enjoyed the painting. I remembered it well. She spoke of her delight with the little pieces of lemon in the painting. It's difficult to describe how much her call lifted my spirits. I went straight into my studio, cut some lemons and painted this. "Pleasant words are a honeycomb, sweet to the soul and healing to the bones." Proverbs 16:24 If you're reading this, kind lady, thank you so much! We just never know when something we say can make all the difference for someone else. oil 6x6 inches Purchase info here. I painted this little piece on a used panel to which I had applied a coat of oil ground. Large swipes of ground gives a lovely texture that shows throughout the painting. Click on the link to purchase, then move your mouse over the image on Daily Paintworks. You'll see the texture I'm talking about. It's a lot of fun to paint on a completely different surface once in a while, and at the same time I make good use of all my panels. Do you have paintings you're not happy with? You can give them new life with oil ground. oil 12x12 inches Purchase info here. oil 6x6 inches Purchase info here. I liked the variety of color, size and shape in this set-up. Do you think about variety when you paint? Maybe I just have a short attention span, but I need variety! IN OTHER NEWS: A "Paint The Lively Still Life" workshop is coming up very soon! March 23-24 at my studio in Upland, CA. It's not too late to register. Email me to find out more. karenwernerart@gmail.com The workshop is geared for beginning and intermediate painters in oil. Do your paintings look stiff and overworked? Do you find painting difficult and tedious? Do you use little tiny brushes? I can help you put joy and life into your work! oil 9x12 inches Purchase info here. Our Meyer lemon tree is loaded with paintable fruit. For this painting I used a cool light source rather than my usual warm spotlight bulb. I rarely rework a dried painting, but this one I felt was worth saving. oil 6x6 inches Purchase info here. I think this is the third "Rock, Paper, Scissors" I have painted. I enjoy the variety of textures: smooth paper, rough rock and shiny metal. oil 6x6 inches Available here. A luscious dessert from The Local Baker in Upland. Painting and life both have their ups and downs. In December I wiped out quite a few paintings, and still have a few turkeys laying around that don't make the cut for posting. On Christmas Eve I had to have my sweet Sandy the studio dog put to sleep. She was suffering so I had to let her go. She is definitely missed. It has taken me this long just to be able to write about it. But things are getting better. I remembered how to paint in January and just returned from a great visit with family in Idaho. I'm excited for my workshop this weekend and to get back to the easel. If you'd like to join us at the last minute for two days of instruction and fun, email me: karenwernerart@gmail.com Sandy in 2015 at Moro Campground, Crystal Cove. oil 8x8 inches Purchase info here. A quick and loose painting from November. My, where does the time fly? This weekend I taught a successful workshop to a small but hard-working group. Even experienced painters said they learned new things! I still have a few openings in my February workshop if you'd like to join us. Just email me at karenwernerart@gmail.com The first day of my workshop I teach design principles, lighting considerations, tips for accurate drawing and value. The value of values cannot be overstated! Here are my two quick value study demos. oil 9x12 inches Purchase info here. My brand new super shiny tea kettle was perfect for creating reflections in this still life. I have a beautiful antique silver frame that's perfect for this painting if you'd like to purchase it ready to hang. Let me know through email. The PayPal link to purchase is for the painting only. IN OTHER NEWS: I still have three openings in my workshop THIS COMING WEEKEND! If you'd like to jump in, just send me an email. Happy New Year! The following paintings have returned from the gallery and have new prices. Click the link below each image for info or to purchase. Thanks for looking! oil 12x12 inches I painted this back in October on a sunny morning in our backyard. The painting has a great sense of early morning light, better seen in person. 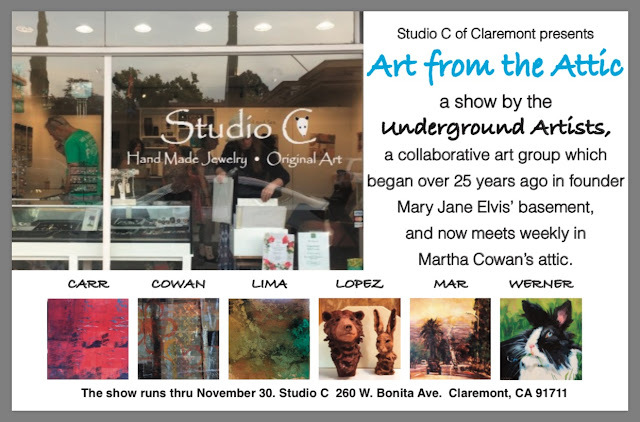 Currently it can be viewed through January the Claremont Community Foundation in Claremont, CA. For purchase information, email me at karenwernerart@gmail.com. I hope you had a Merry Christmas and Happy Hanukkah! I'm looking forward to the New Year with a renewed commitment to new paintings and personal growth. How about you? I still have a few openings in my January and February workshops, if you'd like to learn painting in oils, or boost your skills and enjoy a weekend painting with like minded folks. Just email me for more info. oil 8x8 inches Purchase info here. Here's a summery painting I did back in August. Only recently was I able to get a decent photo of it. It's a gloomy drizzly day here in So Cal. Maybe this piece will remind us of warmer days picking flowers and eating peaches. oil 6x6 inches Purchase info here. Red onions are among the most beautiful vegetables on the planet in my opinion. This painting is framed and ready to hang. Frame: custom dark wood approximately 2 1/2 inches wide, floater with antique gold lip. This piece will be part of "unreNOUNed" a group show in Claremont, CA through December and January. Available for purchase there and online. oil 10x10 inches BLUB is the last in my pet series on display at Studio C, Claremont, CA for the month of November. Just about two weeks left to visit Studio C and see this great show, "Art From The Attic" by the Underground Artists. We're a group of friends that meet weekly to talk, laugh and make art together. BLUB is on gallery wrapped canvas with sides painted and ready to hang. Available for purchase at Studio C and also online here.